Almost directly south of Atlanta about 40 miles, Jailhouse Brewing Company is located in the town of Hampton, GA. We’ve been seeing their bottles show up at the local package stores on a number of occasions over the last few years, and a tremendous growth in the kegs found at local bars around Georgia. This being the case, I was very surprised when I walked through the building for the first time, out to the beir garden area, and realized that there was no more to the building! A very small, old, brick building in the middle of downtown Hampton, this facility actually used to be the town’s jail, which adds mountains to the value of visiting the actual location. Going on the tour and seeing the old jail with all of the interesting facts and facets that have gone into the minimal changes of turning it into a brewery, help you to appreciate where the brewer and his beer’s complexity comes from. 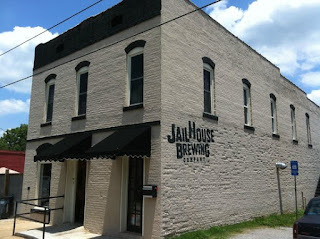 While I can’t say that Hampton, Ga was on my ‘places to visit’ list, it was worth the short drive to taste the new brews that Jailhouse has to offer and to enjoy taking in a bit of history that they are proud to share. In the 8 beers that were offered, more than half were above average in my opinion. As the temp was pushing 90 that day, I was certainly partial to the lighter and more drinkable options than some of the darker beers for which they are often known. As with many rural southern breweries, there are complications associated with innovative minds headed in the direction of progress; Jailhouse spends much unwarranted time battling with the nearby Baptist church that fights to hinder any requests for expansion or investment into the community. The only way to break through this close-mindedness is to ignore the negativity, and keep supporting our valued local brewers! 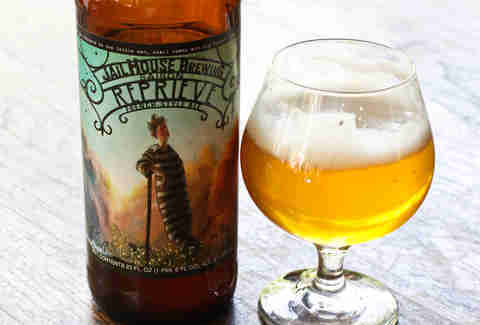 Best Beer: Saison Reprieve - I told you that it was hot, and that I was looking at the more drinkable options, well this is what I found. This French-style saison is very light and crisp while at the same time providing depth and taste. Very lightly tart, the flavors of light hopping and fruits provide most of the character behind the leveled pale malts that make this beer so balanced. Because you won’t be able to tell, make note that this still comes in at 6% abv!